This is an old family recipe. It actually comes from my Great Aunt who originally served us this dessert during a visit to her house in the early 80s. At that time, Mille Feuilles (or Thousand Leaves or Vanilla Slice for you Englishmen) wasn’t super popular. Now you can pick up a chunk at Costco for a reasonable price. I can confirm the Costco version isn’t as good as this. Traditional Mille Feuilles uses puff pastry whereas this shortcut version uses graham crackers. I prefer it with graham crackers because I find the puff pastry gets chewy and basically makes the filling squish out everywhere as soon as you try to cut it. Not a good scene. On top of being super delicious and pretty impressive looking for the effort, this is a great summer dessert because you can make it ahead (in fact it’s always better the second day) and it’s no bake. I hope you enjoy it as much as we do! Cook the pudding according to the package instructions. I do mine in the microwave. Line a 9×9 glass dish with graham crackers. They need to lay flat so nip some of the corners off if need be. Cover the crackers with the cooked pudding and leave this layer to cool in the fridge. Once decently set, whip the cream until fluffy, adding a few tablespoons of icing sugar to sweeten. Spread carefully overtop of the pudding layer and then top with another layer of graham crackers. They don’t have to reach exactly to the edge so don’t worry about that. Pop it back in the fridge while you mix up the icing. In a small bowl mix the butter and the cup of icing sugar with a few tablespoons of milk – just enough for the mixture to reach a spreadable consistency. Spread carefully over top of the graham cracker layer. 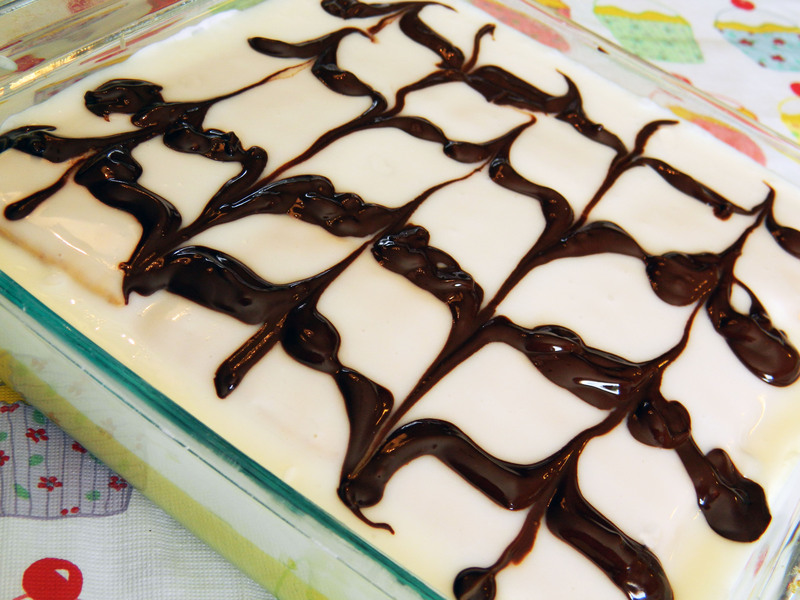 Melt the chocolate and drizzle over top of the icing. To make the traditional ‘zig zag’ pattern, create four lines of chocolate and then take a knife and drag it through the chocolate, alternating directions every inch or so. Keep refrigerated until you’re ready to eat.